BHS Battery Roller Stands provide the ideal location to charge, store, and exchange lift truck batteries safely and efficiently. 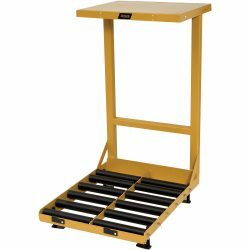 Battery Roller Stands are constructed with heavy-duty steel for durability, with an acid-resistant powder coating. Spark-proof, poly-sleeved rollers simplify battery transfers. Several compartment configurations, safety features, and functional additions are available to provide custom solutions. A charger shelf and CR-1 Cable Retractor mounting holes come standard. BHS Battery Roller Stands are built to withstand harsh battery room conditions, providing a lifetime of dependable service. Contact our sales team at +1 314 423 2075 to learn more about options for customizing the Battery Roller Stand and other Battery Room products. Note: Roller height required when ordering.